Paid owners of appropriate-era cars $20 a day to drive around in the background. Biggest hassle was getting the rights to the songs - Universal wanted to use cover bands to save money, but Lucas insisted on the original artists. But rather than having them play as background music, he recorded them as if the were playing on radios in the cars or at the diner. Cost $90,000 but it was the soundtrack that made the film. Harrison Ford had given up on ambition to be an actor, and was doing well as a set carpenter. So well that he nearly didn't take the AG role bc it paid half what he was getting as a carpenter. Wolfman Jack was a DJ at a 'border blaster' - Mexican radio stations with a 250,000 watt signal that could be picked up almost anywhere in USA. Lucas sat down and filmed recording an entire radio show. He couldn't afford to pay him properly, so he gave him one of his 'points' from the film, making it one of best paying gigs WJ had ever had. The film cost $1 million to make, and earned more than $55 million, making it one of the most profitable ROI ever. Lucas's points gave him $4 million, so he fulfilled his ambition of becoming a millionaire before he was 30. 6'7" Welshman David Prowse was given choice of either Darth Vader or Chewbacca. He chose the villain, so the Wookie role went to 7'2" Peter Mayhew, a genial hospital porter. Lucas had a bet with Steven Spielberg over which film would be more successful - Star Wars or Close Encounters. They settled bet by swapping 2.5% of rights in each film - a bet that made SS $40 million over next 4 decades. Made 3 times as much money from toy licensing than from actual film receipts. Dated Linda Ronstadt for 5 years. 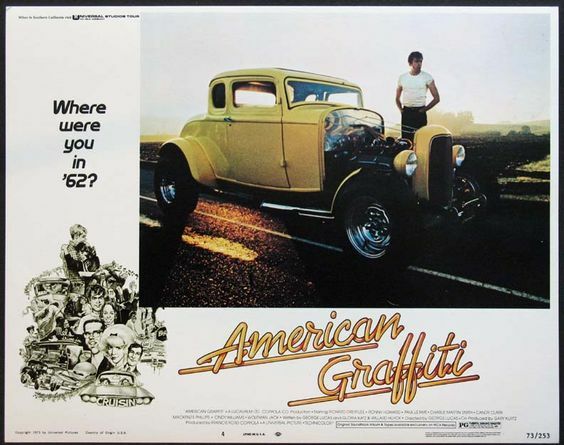 Ron Howard one of few child stars (Andy Griffith Show) and teen stars (Happy Days) to make it to adult acting success (American Graffiti) then to director (Cocoon) and winning an Oscar for directing A Beautiful Mind. He has 2 stars on Hollywood Walk - one for TV and one for film. In 1995 Lucas re-released digitally remastered Star Wars trilogy on VHS. Sold 28 million cassettes, for a cool $100 million profit. Episode I of prequels cost $115 million to make (budget $50 mill) almost entirely out of Lucas' own pockets. But toy compamies fell over each other for rights (Hasbro and Galoob handed over $220 million of shares) plus Lego (whose Star Wars toys made Lego the world's most valuable toy company). Fox paid $80 million for distribution rights, but more importantly, handedover all remaining rights for the original Star Wars film. And by the end of 1999 the film had earned $926 million worldwide, most of which went to GL. When Lucas went back to the Tunisian desert to where they'd shot Star Wars, found a thriving tourist trade. The team had found it was bury the sets than to haul them away, but enterprising natives had dug them up and in some cases, were living in them as well as showing tourists around. The second prequel 'only' made $649 million in first year, nowhere near the take from the first one, but still a wildly successful film. 2004 it was time to release the original trilogy on DVD, taking in $100 million on the first day. The third prequel got to $848 million worldwide.